Adam: I would like to start this interview with a thank you. Tom Smithwick suggested that I visit TenkaraUSA.com when he was reading about my wanting to build a split cane rod to emulate the “cane pole” that I fished as a young child. I had written about my adventures as an adult fishing the farm ponds back in Tennessee and I wanted to make a pole just for fishing that style. When I visited TenkaraUSA.com my prayers were somehow answered even more than I asked for. I could fish a “pole” fly fishing style, tenkara style. Quickly I purchased my first dedicated tenkara rod and learned to use it the correct way. This is how I meet Daniel, I bought a rod from him to realize my dreams as an adult, to have fun fishing as I would a child. My first question to you would be much like my little story. “How did you come to find out about tenkara? Daniel: Much like you I think I had been craving the simplicity and relaxing fishing experiences I had as a kid for some time. I didn’t know that tenkara was what I was looking for, but I think my mind was alert looking for something. A few years ago I had the opportunity to study in China for a few months. That started a growing interest in Asian cultures. At that time I also started dating my now wife, Margaret, who is Japanese American. I’m not an Asian scholar, but a couple of years ago I had this theory that Japan must have some beautiful fishing history, and that in it there must be a wonderful fly fishing tradition too. I then happened to start researching the presence of fly fishing in Japan. Then I came across a book called “Angling in Japan” at the local library. It talked about several methods of fishing in Japan, among them tenkara – which ironically only has a very short reference to it. That’s how I learned about the existence of tenkara fly fishing. Then, upon visiting Japan I was enthralled by the tenkara gear I found in tackle shops, and the fishing method practiced in the steep mountain streams. It combined my love for fly fishing, with what I had unknowingly been craving, simplicity. Adam: From my understanding, there are a lot of anglers that feel that they can fish tenkara style with telescopic poles (mostly of the crappie variety) Usually these anglers feel that tenkara is not in the equipment but the technique. From my own standpoint, I was in that category until I purchased a dedicated rod (a Tenkara USA “Ebisu”) and started to fish it, understanding the subtle aspects. At that point I realized that what you and Chris were saying was true. Daniel: The main differences between tenkara rods and crappie rods are found in the quality of construction, lighter-weight materials, and some of the design elements of the rod, such as the taper, which allow it to cast a line the way a crappie rod just can’t, and the handle which provides good balance to the rod, as well as comfort for a day of casting. Just try removing the handle from your western fly rod and casting with it all day long, it will be a bit painful. A tenkara rod feels much lighter and is comfortable to be used for casting over extended periods of time, whereas a crappie rod is designed to be cast once and then be put to rest until a fish bites. Crappie rods also have a whippier tip that dampens the cast and does not effectively transfer the energy from rod tip to line, which is essential in fly casting. Adam: Daniel, in my years of making forums for my different interests, I have come to find that many of the participants of a particular forum often have the same interests. For example, I organize a forum based site on bamboo fly rod construction. I have an idea of a guy who makes bamboo fly rods and it isn’t really what I ended up understanding. When I was young, I started out skateboarding in the city, I’ve always fished since I was a child but there are other interests in my life. I evolved into a surfer and then into a hang glider pilot. In all that I do, I love to surf the things that I do. At that bamboo fly rod forum, I found that many of us were “surfers” and have similar interests besides fly fishing. Daniel: Oh, yes. I have always had many interests. Fly fishing is the one that has really stuck with me the longest and on a more consistent manner. I love rock climbing and have been climbing for about 12 years now. I also grew up surfing, since I was 7 years old, though that never made me very good at it. I also keep some planted fish tanks, which I love since it connects me with water and life even in my office. I just love being out (or feeling like I’m outside) and finding something that engages my mind as much as my body. Adam: Having been privy to a small portion of the industry as an insider, I have seen first hand the interest of foreign companies to sell products to the USA. 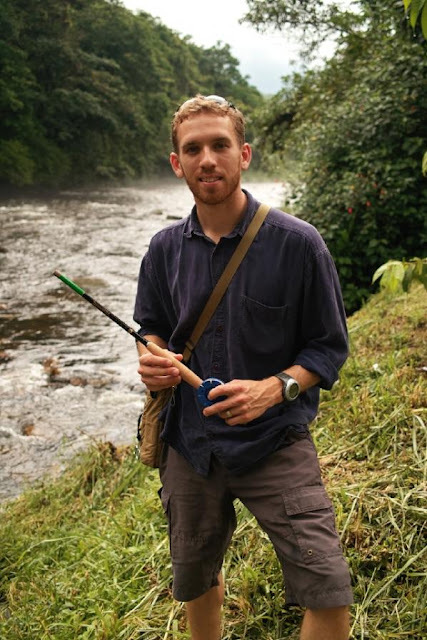 From my own research into tenkara manufacture and suppliers, I see similarities yet I understand that you have worked with another American company, (backpackinglight.com ~ Ryan Jordan) to develop a specific rod. Daniel: Yes, all tapers are original tenkara rod tapers developed by myself with assistance from engineers in the field. After launching the company and getting the attention of backpackers, Ryan Jordan at Backpacking Light started doing tenkara fly fishing. He soon became a huge fan, after all the tenkara philosophy goes very well with his own philosophy of simplicity. He then asked us to develop a rod for him, which I gladly did. Daniel: Most people would respond saying that such a question is like asking “which is your favorite child?”, and while I developed every single rod in our lineup to meet one very important criteria: to feel pleasant for me to fish with, to feel good in my hands, and to be something I’d like to fish with. I do have to say the Ayu has probably been my favorite and is the one I find myself using the most, mostly because of its longer length. It has a nice and soft action, it’s a longer rod which is a good fit for California’s wider streams, and it casts very light lines very well. I have tried sticking with one rod exclusively from the beginning to test durability of rods and see if any issues arise with time and go through what my customers may go through with one rod, and the Ayu is what I use most of the time. I use other rods periodically to make sure they are also seeing their share of fishing. I have to use the Amago more this season, I have a feeling it could become a new favorite too. Daniel: Without a question, small mountain streams. It’s more than just the water, it really is the surroundings. There is a good reason I’m a trout angler, it takes me to pristine places with clear water, moss on the rocks, trees and that best music of all, running water. Daniel: Not really. In fact I use the traditional lines a big part of the time. In fact, I did not even start using level lines until Chris Stewart “persuaded” me to try them. I really like how the traditional line casts and how it presents a fly very delicately, but being in California and having wider streams I saw the level line mostly as a tool for reaching a bit farther while still keeping my line completely off the water. Both lines have their places, and I’ll always carry a spool of each. Adam: From my enthusiasm in researching all related tenkara media, I see that you have worked with and are friends with Chris Stewart. From my personal interactions with Chris, I understand that he is a kind and generous person and extremely knowledgeable tenkara enthusiast. Daniel: Right after having the idea for Tenkara USA I bought the domain and setup a placeholder page. Chris was the first person to contact me through that site. I thank him for persisting in contacting me because the email given on the page was wrong and he tried a couple of variations to get a message through, he was excited to see something becoming available here. He had already been tenkara fishing and knew quite a bit about it. Then he told me about this tenkara event taking place in New York a few months later, the one where Dr. Ishigaki came from Japan to talk and demonstrate tenkara. It was an incredible coincidence, a tenkara event in the US just a couple of months after the planned launch of my company??? Since Chris is in New York we agreed to meet, and spent a little time fishing. We have exchanged several emails on tenkara, and I learned a lot from him. I can say we are good friends now. There is no commercial relationship though. Adam: I recently purchased the Amago and am readying myself to use it as one of my primary rods this season. Daniel: Part of my “job” is to continually play with new rod concepts and ideas. Many of them will never make it through my criteria, and that’s okay, it keeps it fun. All rods, and the Amago is no exception, are tested over several months of fishing and extensive casting. For the Amago I had been looking for an even longer rod that would feel comfortable and well balanced; it would be light and provide great sensation when hooking a fish. I’m not a scientist, I just knows what feels good, and after a few prototypes and tweaks the Amago felt good for release. Daniel: I think at this point 13 1/2ft is the longest. I like long rods, and have experimented with many, but there is a point where it becomes difficult to balance the rod properly and to have a long rod that is also comfortable to cast all day. There are a couple of longer rods available, but in my experience they are not so comfortable for a long day of fishing. Adam: Daniel, you are free to write anything you want on this last one, I promise to publish it verbatim. Is there anything you want to say to the viewers of tenkara-fisher.net? All I can really say is enjoy the fly fishing simplicity of tenkara! You’ll be in for a treat, a bit of going back to simpler times, a bit of advancing to a new level, and mostly just enjoying a new fly fishing feeling. Also, well done on tenkara-fisher I hope many people will enjoy the resources of this site.